Hybrid drive and potential fuel savings are well known — from 10 to 30 percent, according to the sources we’ve written about over the years. Less known, is the potential need to purchase some sort of remote monitoring package to complement that diesel-electric or battery hybrid system from a system operator in order to secure the maximum safety benefits. As the count of system operators offering hybrid drives grows, so too, it seems, there’s continuous need to look at who they are and what they’re offering. “We can get close to real-time data back to the center here,” says ABB global technical support manager, Stian Braastad, as he shows us some of the back-up being offered live to ship owners and captains out there, somewhere, in the world’s oceans. “If something happens on board, it will take from three to five minutes before that event is actually displayed on one of the dashboards here. The lights in the ceiling will go red, and our technical support engineers will be able to see the vessel specifications. They’re available 24/7.” Braastad is echoed by Kenneth Nakken, vice-president of ABB digital services, as both show us the finer points of ABB’s new Ability remote diagnostics support system. “It means captains are not alone anymore,” Nakken adds. The few modern versions of diesel-electric hybrid drives that are fitted with marine batteries must also be monitored, as evidenced by their battery-cabinet smart screens and the claims of those who battery cabinets. “We would know if anything’s wrong (with a ship’s lithium-ion batteries) long before the captain would,” a battery solution provider recently told us. His batteries were all “Internet of things,” meaning remotely monitored, and system integrators like Siemens and ABB are very aware of the myriad reasons monitoring batteries will be necessary. “We see the same things as the crew onboard, so we work together with them to trouble-shoot the case,” says Braastad after pulling a vessel’s particulars up on the screen. Presumably, he’ll one day also be talking about hybrid drives with batteries. If problems with these arise, like fire, then poisonous, explosive gases could form. Battery fires themselves are caused by so-called thermal runaway, a chemistry problem the battery module is engineered to solve. Still, while some battery solutions providers say their method “eliminates thermal runaway”, others say theirs reduces the risk of “thermal runaway”. It’s a tough call, but again, remote monitoring would seem to be necessary. While Siemens offers the Internet of Things and monitors its own battery systems as part of the energy management system it offers, most diesel-electric hybrid propulsion systems installed by Siemens Marine are not fitted with large marine battery modules (a new thing) and are instead of a type where four to six diesel engines power electric generators that turn a ship’s propellers via a frequency converter. These hybrid drives are quiet, their diesel engines aren’t yoked to the propeller, and they’ve now been around on offshore supply vessels since the mid-1990’s. They’re also more complicated with more automation and electrical circuitry to monitor. So, Siemens offers its own integrated automation of converters, motors, couplings and gears and offers maintenance, management and big data decision support from services like SISHIP EcoMain or products like SISHIP EcoProp hybrid propulsion or all-electric BlueDrive PlusC frequency converters. Importantly, however, maintenance courses on diesel-electric generators are offered ship technicians. Prior to its 2011 launch of the IAS 400 and Web-based Teleservice centered on the popular SIMATEC S7 automation model, Siemens had also for years offered redundant automation and diagnostics for all ship’s applications. Still, on-site service engineers have been de rigueur at Siemens Marine in Norway, and how much this will change in “the age of digitalization” or what reliance there’ll be on electric generator training for crews isn’t easy to foresee. Avoiding sending a service engineer has been accomplished by crew training, digital monitoring via interfaced electronic tags (by ship’s crews) and by remote operations and maintenance support. Another system integrator that seems to have its own hybrid drive and marine battery solution and remote support is Norwegian Electric Systems AS, formerly Havyard Electric. The decade-old outfit offers a switchboard-free solution for ship’s power and a hybrid diesel-electric drive solution that requires one switchboard for each liquid-cooled Quadro Drive frequency converter (to-thruster) solution. “The (trademark) Quadro Drive frequency converter is specially designed for ship installations and sets the standard of next generation propulsion converters,” NES asserts, adding, “Quadro Drive requires no large transformer, making installation much cheaper and simpler.” An “active rectifier” might also allow the reclaiming to the ship’s grid of energy from the propeller. A NES hybrid drive featuring a battery is understood to be open to condition-monitoring from shore using a system called RAS, or Remote Assistance System. While NES did not return our queries, a battery solution provider gave us the NES reference, a suggestion, perhaps, of another partnership akin to those Siemens and ABB have forged with their energy storage providers. NES marketing material says it offers solutions “you can afford” and “(remote) access to the ship’s propulsion system in a matter of minutes”. A photo shows a company man with a laptop “on location” and looking “remote” while servicing a client in Africa. While Siemens automation solution was (perhaps still is) Web-based and ABB uses Office 365 and the Microsoft Azure cloud to access ship’s power systems, NES says “a vessel’s satellite communication system” will help solve problems anywhere in the world at any time”. Of course, ABB’s claim is also global, and we did see the excellent oversight its engineers had of their clients via the Ability Solutions it launched in March 2017, when “all devices and sensors on everything went to the (MS Azure) cloud”. Now, rather than sending out a service engineer over 48 hours to reach one ship, one engineer might manage 10 ships from operations centers in Houston (day help), Asker (offshore vessels, Norway), Singapore (drilling) or Helsinki (passenger and cargo) with new centers understood to be opening in Shanghai, Miami and Genoa Italy later this year. A 10 percent fuel savings is said to be possible for using the advice, onboard software and fleet management Ability offers. All system integrators say “they dig into the real data” and they appear to be doing so, although, it would seem, marine batteries might require their own separate monitoring. Our email probes on the issues batteries might present for remote diagnostic tools went unanswered. Nor is it clear who, apart from ABB, offers remote alarm monitoring or which have “taken the expertise into an algorithm (as, say, Emerson)”, or which integrators stop short of doing uncalled-for maintenance when condition monitoring suggests you don’t need it. “I went to many digital ship conferences and everyone I met said we’re not being taught this (condition-monitoring stuff),” says Nakken. “It needs to be simple even for an engineer or a chief engineer,” he adds. Siemens in Norway, for their part, offer maintenance classes and likely much more. ABB seems to offer all the expertise needed to help crews fix problems remotely. NES is known to at least send a man to a remote location for service help. Perhaps much more. ABB, meanwhile, has 3,000 vessels in its client group that appear to use ABB electrical kit and perhaps 150 of these are using Ability diagnostics via service centers across the globe. “If we pick up a critical (system-stopping) fault we always contact the onboard crew and the (owner’s) onshore vessel management to at least offer onboard assistance,” says Braastad, as he pulls another vessel, a floating producer, onto the giant dashboard screen. Depending on the deal the customer’s subscription, ABB can go beyond trouble-shooting to offer preventive feedback using data collected every three months on all from cooling systems and frequency converters to the effects of operations on electrical breakers. Even oil system particles in an azipod are monitored. 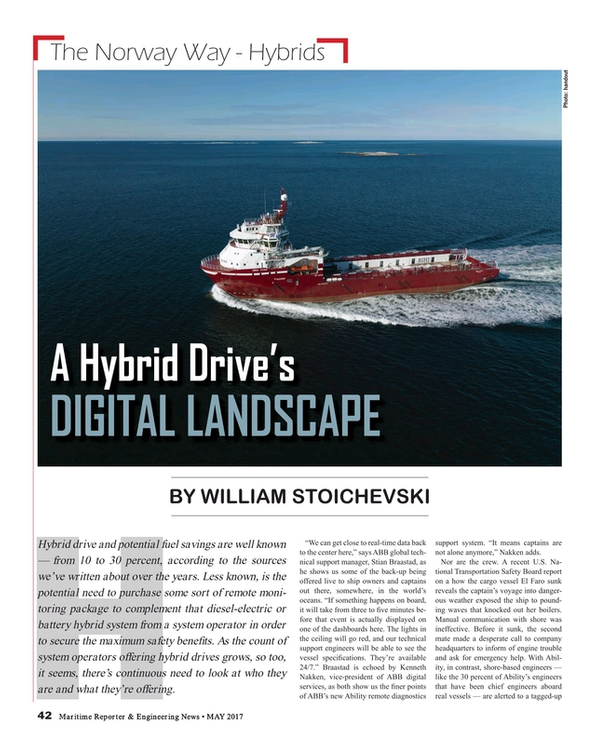 That’s a broad digitalized offering of support to ship owners owning highly automated hybrid drives. Broad digitalized offerings are all the rave right not.